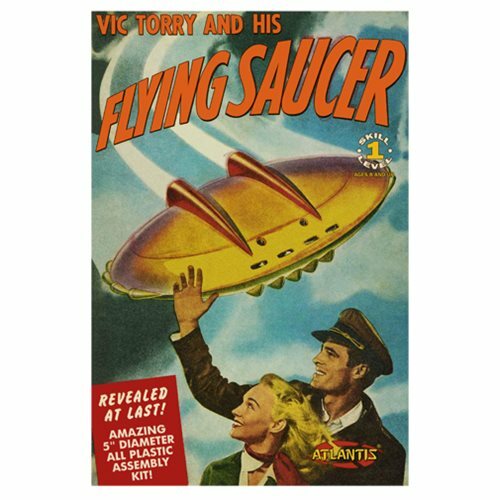 Direct from 1950's comes the Vic Torry's Flying Saucer 5-Inch Model Kit with Light! Loosely based on the 1950's comic book Vic Torry and His Flying Saucer, this model kit features multiple pieces with clear parts for a windshield, a poster-like backdrop, and even a display stand. But that's not all! It also comes with an LED blinking light for night-time illumination. This model kit is for skill level 1 and features easy Twist-Tite and glue assembly required. For Ages 15 and up.